A new translation of philosopher Walter Benjamin's work as it pertains to his famous essay, "The Storyteller," this collection includes short stories, book reviews, parables, and as a selection of writings by other authors who had an influence on Benjamin's work. 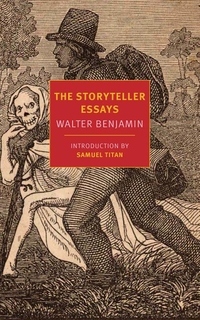 Walter Benjamin's "The Storyteller" is among the greatest and most widely read essays of this ever-suggestive but also enigmatic master thinker. Published in 1936 in an obscure Swiss review, "The Storyteller" was the product of at least a decade of ongoing reflection and composition. What might be called the story of The Storyteller Essays starts in 1926, when Benjamin wrote an essay about one of his favorite authors, the German romantic Johann Peter Hebel, and then continues in a beautiful series of short essays, book reviews (of Arnold Bennett's novel The Old Wives' Tale, among others), short stories, parables ("The Handkerchief," written in Ibiza in 1932-1933), and even radio shows for children (The Earthquake in Lisbon). In this new collection these writings are brought together in one place, giving us a new appreciation of how Benjamin's thinking changed and ripened over time. These superb and wonderfully readable pieces are further accompanied by some key readings of his own--texts by his contemporaries Ernst Bloch, Georg Lukács, and Jean Paulhan; by Paul Valéry; and by Herodotus and Montaigne--and finally, to bring things around, there are two short stories by "the incomparable Hebel" with whom Benjamin's intellectual adventure began. Tess Lewis's magnificent new translation further refreshes our understanding of the work, while editor Samuel Titan's introduction fills in the biographical and intellectual context in which Benjamin's "The Storyteller" came to life.